When it comes to creating the perfect floor, we’ve got the tools for the job. Floor grinders are the ideal tool to remove thin layers of glue, epoxy and paint from the floor’s surface, which is then polished for a flawless finish. A floor grinder can also be used to level out uneven floors and finish off messy joins. 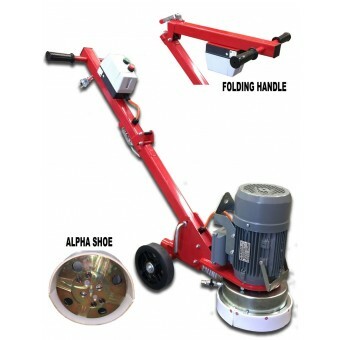 Electric floor grinders are designed for maximum performance. Some models include a removable shroud system to allow grinding as close as possible to walls and floor protrusions. Check out other convenient features including dust extraction ports, extendable wheels and folding handles for easy transportation to and from the worksite. Our range of Crommelins and Hoppt floor grinders are designed to help you spend more time on productive work and less time worrying about the machine. No matter your experience, these floor grinders are easy to use and manage. So, even if concrete conditions and finish demands vary, you can still meet the deadline.